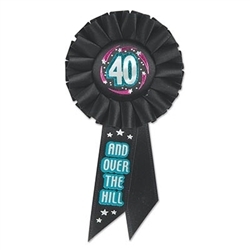 Poke some fun at a loved one on their fortieth birthday with the 40 and Over The Hill Ribbon Rosette Ribbon! Everybody knows that 40 isn't really over the hill, so play a friendly joke on your family member or friend! He or she will be sure to smile and laugh at the fun! The 40 and Over The Hill Ribbon Rosette Ribbon is a black satin ribbon that features metallic silver and green lettering. Each ribbon also features silver and fuchsia star graphics. The birthday guy or gal will be sure to appreciate your "happy birthday" gesture. Be sure to check out some of our fortieth birthday party supplies, like the 40th Gleam N Burst Centerpiece and the "40" Cascade Hanging Column.